Yesterday, I did a quick impressions post on the brand new Istanbul New Airport. 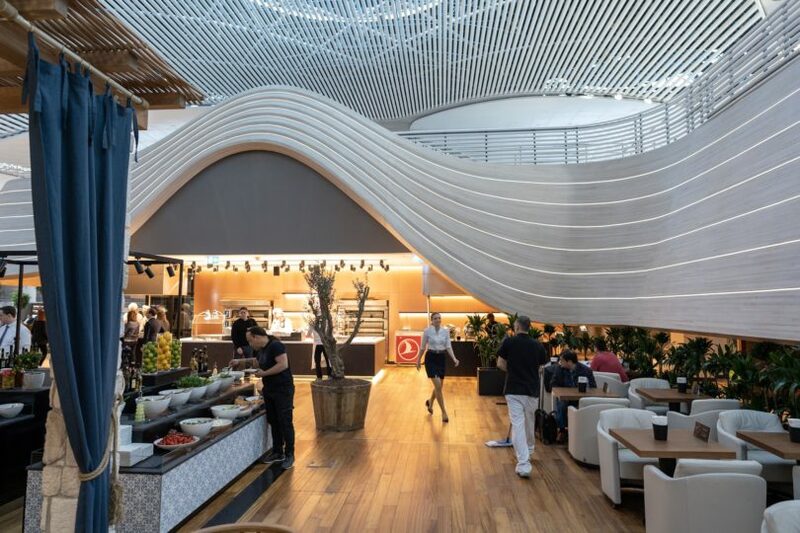 I will have more photos and thoughts tomorrow but wanted to post a review of the brand new Turkish Airlines Business lounge at the Istanbul New Airport now. The old Turkish CIP Business Lounge at the Ataturk Istanbul Airport was my favorite business class lounge in the whole Star Alliance network. It had some rough spots as more people began to go but it was still an incredible lounge. I was excited to see what Turkish Airlines would do for their brand new lounge and was not disappointed! 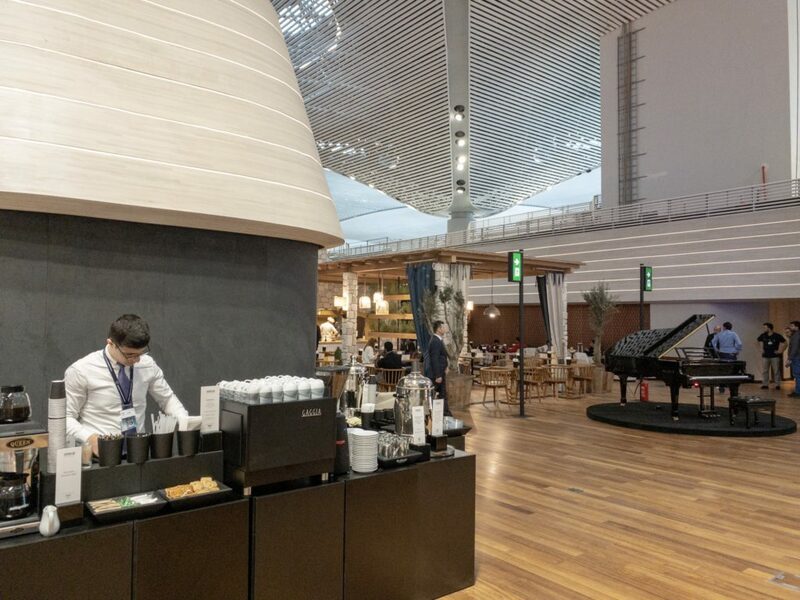 First, there are two business class lounges with Turkish Airlines at the Istanbul New Airport. The new Exclusive Turkish Airlines Business Lounge is not yet open but that will be exclusively for passengers flying Turkish Airlines business class (I was told different things by agents but I am pretty sure that will be only for long-haul passengers). The New Turkish Airlines Business lounge that is open and that I went to is for business class passengers and Star Alliance Gold members. The lounge is on an upper level in the main concourse area of the airport. If you are walking over from Terminals A and B (where my flight arrived from the US and my connecting flight departed from), you have to walk a while to get to the concourse and then it will eventually be on the left. There is a lift (that was not working yet) and a little bit past that and to the left, there are escalators to the lounge. Similar to the lounge at the old airport, there are electronic gates that will scan your boarding pass and open if you are able to access the lounge. Once you enter, there is a huge display on the wall within Turkish Airlines videos and photos. To your left, there are the kiosks that will give you internet access. As at the old lounge, all you need to do is to scan your boarding pass to take the receipt for internet access. To the left of that past the wall is the luggage storage area. It seems that there are many more storage lockers than at the old lounge in the upstairs portion. However, I don’t think there are more lockers than the old lounge had on both levels combined. At least all of these were new lockers so all the locks worked (the old lounge had many locks that were broken). They work the same as at the old lounge – close it and enter your pin code and hit the # sign to lock it. Enter the pin to unlock it – done! I was able to fit my 20” carryon and my backpack easily in there with much more space on top of both of those. If you keep walking past the storage lockers, there is the lounge concierge. This is where you can sign-up for the showers and sleeping suites. The rules with the sleeping suites is that you have to be flying long-haul on Turkish Airlines in business class and have a layover between 4 – 7 hours long. This is similar to the old policy at the other airport. The sleeping suites are at an overlook area near the concourse with heavy curtains. Inside, you have a charging station, table, and lounging bed. I was able to use it for a little while yesterday since the lounge was not busy yet (and they didn’t have any one in the lounge that fit the allowance rules yet!). There are food stations scattered throughout the lounge. I will have a walkthrough video uploaded tomorrow that will show each of these stations but there are some photos here to show you some of them. They have the Asian food counter with food similar to the old lounge. The chicken and rice (not sure what the exact kind of chicken it was) was really good! There is a centrally located station with Turkish flatbread. I hung out here for a while eating the fresh-out-of-the-oven cheese and garlic bread and it was incredible! The pasta station is still here along with another station for Turkish Manti (the stuffed dumplings). This station at the old lounge was downstairs and kind of out of the way. This one, like all the food stations, is located in the central aisle area of the lounge and easy to find. One of my favorite food stations from the old lounge is here as well – the station with Turkish meatballs, grilled chicken, grilled vegetables, and rice. If you visited the old lounge, you probably loved this food as well and it tasted even better here! There were not a ton of people here but I did not notice a line of people longer than 3 people at any given time as they had more grill space. Desert stations are scattered throughout the lounge as are coffee/tea stations. There are also some fruit and vegetable stands around as well. The same is true for a pretzel stand. Nothing really different with any of these areas – all good food! The teaser photos that Turkish Airlines showed last week of the lounge had some wondering if they just moved the old furniture from the old lounge to the new one. That answer to that is yes and no. Some of the lounge areas have the white couches that are still in the best condition while there are cafe style sitting areas with completely new furniture. There is also a darker lounge area that reminds me of a formal library setting or an old smoking room. This has some dark furniture and it looks very elegant. It does have large screens on the wall so this area could double as the movie theater replacement (since there is not such a place in this lounge). There is an area near a wall full of televisions like at the old lounge. While I kind of understand having all the TVs in one area, I don’t think it has enough seating for as many people as may want to watch TV. I suppose a better solution would have been to split up the displays into different areas to allow more areas for people to watch. I guess we will have to see! Near the overlook of the concourse, there are also lounge couches there that were in great demand yesterday with only a few people in the lounge! This means that, if you really want them, you better be ready to jump in when someone leaves! Finally, there is also a small meeting room that you can reserve if you want to have a business meeting. This is something different from the old Turkish lounge. The old lounge had a small children’s play area and the new lounge really upgraded this place! There is a large airplane fuselage with stairs leading into the airplane as a play area for kids as well as much more space for kids to spread out and play with toys, read books, and more. Definitely a big upgrade! There is a small room tucked away that has four game stations. This is similar to the old lounge but now they have put all of them in one area. The TVs are larger and this will be a popular area. But, it may not be easy for everyone to find (I will have it on my walkthrough video). Finally, there is still a golf area with a trainer to help you enjoy it to the max. Like the old lounge, there is only one so plan on either waiting in line or sitting nearby to wait for a turn. Chalk this up as entertainment/work – the computer table! This is across from the storage lockers and it does seem that the computers are newer than at the old lounge, but it could just be the much better lighting! So, how was it? I didn’t have a ton of time in the lounge and it was not full so there will certainly be more thoughts on this the next time I go through. Also, not all the attendants had information that was the same as they are still learning as well. The internet, unfortunately, was just as disappointing as at the old lounge. I ran a Speedtest and even though the jitter and ping numbers were pretty good, the speed was all over the place. It started around 7Mbps and then dropped to 1-2 for both upload and download. It seemed even slower than that in real use. I ended up having to switch to my Google Fi sim to get anything done. I cannot imagine when there are even more people in the lounge in the future. The food was fantastic! The lounge staff was very kind and there were the usual roaming massage therapists that are available to massage you on the spot if you are a little tight after your journey. The seating certainly seemed adequate for as many people as this lounge will likely hold. It will be hard to tell until a later date when all the airlines are flying here, but it seemed pretty good. One thing I liked was the difference seating. There were at least 4 or 5 different couches or lounge areas around the lounge so this gives you more of a variety. Does the new Turkish Airlines Business Lounge beat the old lounge? I think it definitely does in the layout, food, sitting, and lighting! Thank you and thanks for the correction! I am so bad with correct food names. 🙂 Yes, you are right about the koulouri as well! So, the other Business Class lounge will likely be better? What do you think? It will sure be less crowded! Yes, the other one will be much better! It should also help with any eventual crowding in this one as well since there are many long-haul passengers that would be in this current one anyway. Really appreciate the great photos and video walk-through! So, there will be an additional Turkish Airlines business lounge for international travelers? The airport already has two Turkish Airlines business lounges, one for domestic flights and one for international flights. If another opens, that will be awesome! The Turkish Airlines website the Lounge tab shows 3 lounges: Business, Miles & Smiles, and Domestic. The pictures and descriptions of the Business and Miles & Smiles lounges are nearly the same, but the Business lounge mentions sleeping suites and showers. Also, access to the Miles & Smiles lounge is by elevator opposite C1 boarding gate; access to Business lounge is by escalator opposite gate D1. Do you think that the exclusive lounge will be exclusive for only elite plus member ? From what I was told (though there were bits of information from different reps that did contradict on other issues so we will see! ), it will be for TK Elite Plus members and those passengers flying TK business long-haul. Thank for your replying. I am also the elite plus member and i will flight back to Asia next week and i hope they will open the exclusive lounge. By the way, do you know is there any different between THY miles and smiles lounge and THY business lounge ? Nice review. Would you consider it to be worthwhile to route through Istanbul because of the lounge if flying *A business? Also, do US citizens transiting need a visa? Thanks! It would depend on where you are headed. I prefer TK business all the time over even ones like LH because of things like the lounge, the longer flight times from the US (which allows for actual sleep!) and the flight schedules. Definitely do it at least once to check it out yourself. In my opinion, it is better than other lounges that you would have access to as a *A business passenger. I don’t see anything new here unfortunately. The old lounge had many of the exact same features, this one is just new and not yet overcrowded. I am not wowed. Which is actually okay on some level since the old lounge was really nice but also a little disappointing since I was hoping for Turkish to do some real innovating here to make it top the old lounge! I’m glad to see they still have the pide (the flatbread). Maybe the Turkish Business Class exclusive lounge will be the innovative one! Also, did you see the shower rooms? I really disliked the old ones- no ventilation = sauna and mold. You’d take a shower and immediately start sweating. I didn’t make it to the showers this time (they were in use when I was going to check them). While you are right that there are no new features for this lounge, I personally really prefer the new lighting and higher ceilings of this one, in addition to the more stretched out design (instead of two floors, especially with the old one being a bit dense with seating downstairs). Wow it looks pretty nice! Fast walking, it took a little under 45 minutes. There is no transfer train or bus. My arriving flight was 30 minutes late, and with the 45 minute walk using all the moving walkways, of course I missed my flight and was exhausted. The airport are advising minimum 3 hour connection time for international to domestic transfers, and though i thought this was a wild exaggeration , I now understand why. I conclude this airport is not suitable for international to domestic transfers, and will be using Sabiha Gokcen whenever possible in future. Architecture is designed to impress with little thought for practicality. Distance from down town with no train/metro access and very limited airport hotels also very negative. Looks nice, thanks for the walk through and review. Very happy this lounge has sleeping suites, they’re great for our long layover, it makes a huge difference to us to have a lie down for a few hours on land. Sorry to see them out near the concourse with just a curtain for privacy; but thankful to see them! The lounge lacks attention to detail. The private rest areas are not private at all. The curtains cover only the side walls and the front is wide open facing the noisiest part of the concourse and there is a walkway that is busy with other travelers walking and rolling their suitcases. The lights of the suites do not dim and if you plan to sleep you will need to bring an eye mask and something to cover yourself with. The back cushion is way too big to act as a pillow and the couch potion is too short to act as a bed. Really uncomfortable. The noise by far is the worst of the problems!